The share of renewable energy resources for electricity production, in a distributed setting (DG-RES), increases. The amount of energy transported via the electricity grid by substitution of fossil fuels for mobility applications (electric vehicles) and domestic heating (heat pumps) increases as well. Apart from the volume of electricity also the simultaneity factor increases at all grid levels. This poses unprecedented challenges to capacity management of the electricity infra-structure. A solution for tackling this challenge is using more active distribution networks, intelligent coordination of supply and demand using ICT and using the gas distribution network to mitigate electricity distribution bottlenecks. In the EU FP6 Energy Program Integral project, a large scale heterogeneous field test has been designed for application of the software agent based PowerMatcher technology. The test is conducted in a suburb of Groningen, Hoogkerk, and entails approximately 30 homes with either a ‘dual fuel’ heating system (electrical heat pump with gas-fired peak-burners) or a micro-CHP. Homes also may have PV. Furthermore, a wind production facility and nodes with electricity chargers for EVs and electricity storage are part of the Virtual Power Plant cluster, constructed in this way. Domestic heating systems have intrinsic operational flexibility in comfort management through the thermal mass of the dwellings. Furthermore, the field test comfort systems are equipped with possibilities for hot water storage for central heating as well as for tap-water. Finally, having additional gas-fired heating capacity for electrical heat-pumps adds to increasing flexibility by switching the energy source dependent on the status of the electricity grid. Purpose of the field test is using this flexibility to react to phenomena in the electricity system. From a commercial perspective, the aggregated cluster reacts on small-time scale events like real-time portfolio imbalance, compensation of ramp-up and ramp-down induced phenomena of large generators and compensating for variable output of renewables like PV and Wind. Aim for the latter is to reduce the margin between realization and forecast of a portfolio containing these resources. From a distribution perspective, the total load on the transformer is monitored and coordination also involves diminishing this load during peak periods to improve the utilization of grid components and increase their lifetime. An extensive socio-economic study is performed on user perception of the control of these new types of installations. 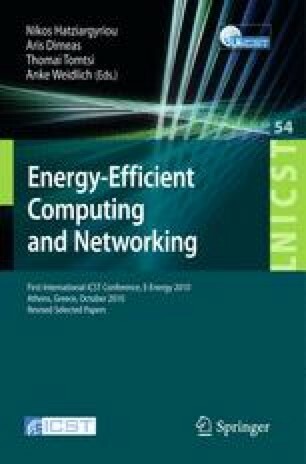 In this paper, the component configuration and set-up of the field-test and the architecture of the ICT-network for coordination are discussed. The test has commenced in December 2009.